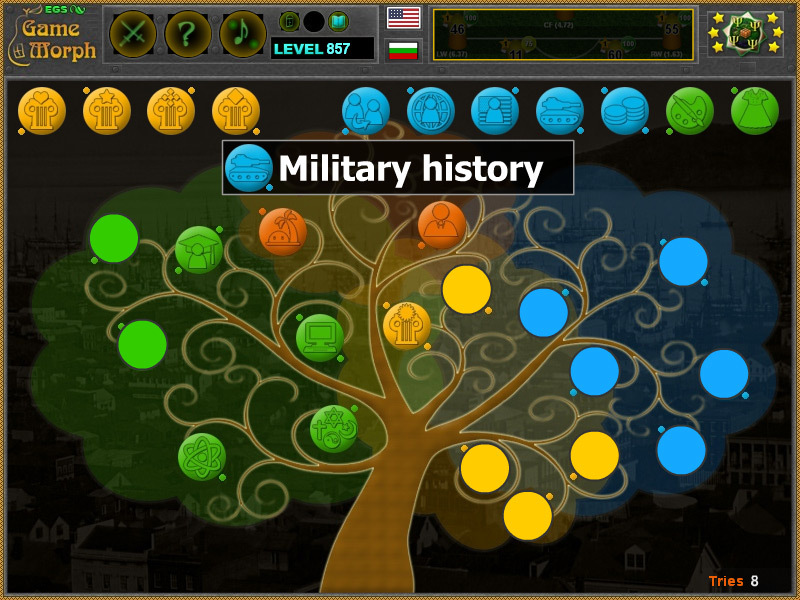 The "History Tree" is a free online knowledge level game, about the subjects of History Science, fields of study, historical sub-disciplines and interests of history. Drag and drop the round pictures in the history tree of knowledge. A small mosaic puzzle for desktop computers, laptops and tablets, which may be played in the web browser. The History Knowledge Board include 18 pictures of history subjects to play with. It is cumulative with the History Tree Test. Which are the main historical interests? Which are the history branches? How to play History Topics Tree. On the top of the screen, there are 18 stylized pictures of different studies in histor. Rolling over the picture reveals the name of the historical subject. Every history icon is in different set of colors, which sign the fields group. The main tree is in the middle. The empty sockets are colored in group colors too. Drag the small round history pictures and drop them over the appropriate color on the tree. The pictures will remain active, until they all are arranged correctly. There is a small counter to the bottom right. It is used only for evaluation in fun classes and will not affect the knowledge level achievement. If the game is used for learning, the teacher read the text in the class subjects while the kids are placing every single piece of the puzzle. Know at least 7 subjects of the history. Class subject: What is the study of history. This fun mosaic game, is a simple giude in the vast world of history studies. Here are the main subjects and examples of them. Migration history - History of human migration. World history - It examines history from a global perspective. Regional history - Studying and analysing social development of period-specific cultures. Military history - Recording of armed conflict in the history of humanity. Economic history - The study of economies or economic phenomena of the past. Historians - Herodotus, Dio Cassius, Livy, Appian, history persons.